The whole country and millions of people all over the world are glued to their televisions today to watch Prince William and Catherine Middleton get married in Westminster Abbey, London. It is a public holiday in the UK although some people have to work as the whole country cannot just shut down. 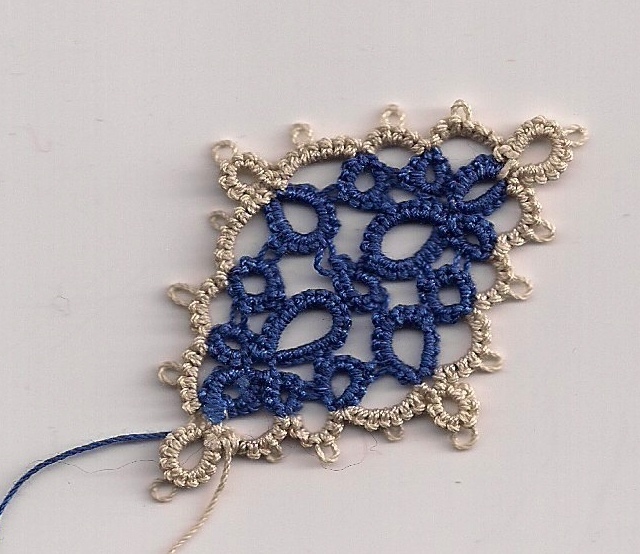 Therefore it seems only right to mark the Royal event with a bit of tatting, so here is a row of crowns, designed by Jon Yusoff and the link is here. I did make the top middle gold ring slightly longer and it is supposed to represent the Queen's crown with jewels in, hence the beads - well you have to use your imagination. Jon said after she had named it that the crowns looked more like scared faces with hair sticking up! 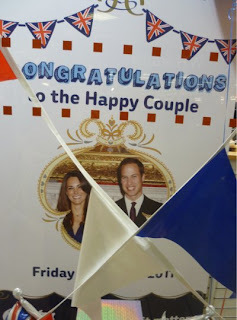 So they could just represent lots of people cheering the happy couple. The thread is some I have had for ages it is Altin Basak and the gold always seems to break when you work with it, but it is useful for small projects like this. 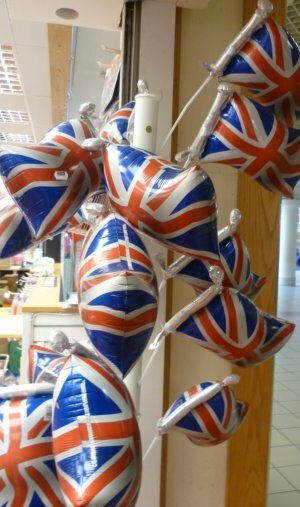 The hype building up to the Royal Wedding has been everywhere and I photographed these pictures yesterday whilst out shopping, the bunting has sort of hidden the words, but you get the gist. And no I did not get an invite to the wedding, but in 2007 I was invited to another Abbey church three miles from where I live to attend a service where the Queen was commemorating the signing of a royal charter 400 yrs ago. In fact I was on the end of the aisle, so she walked very close by me. The security was very tight that particular day, we had to park our cars in a special place and then get on a coach and go through stringent checks hours before the service. That was the nearest I ever came to being close to Royalty and will ever likely be. Prince William and Kate Middleton will take the new titles of Duke and Duchess of Cambridge after their marriage today but it is forecast that the popular press will call her Princess Kate - we wish them every happiness for the future. 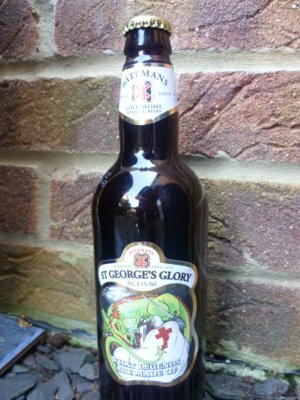 And I drank to St. George the patron saint of England and Scouting! I was born in the same town as the famous bard of Avon. Playing in the wanton air:"
At the moment England is bathed in glorious sunshine, temperatures are way above normal for this time of the year. In early May carpets of bluebells are seen but this year they are early because of exceptional weather we have been having and the display is almost over. 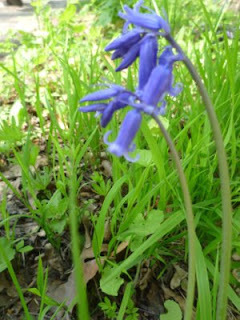 I took this photograph yesterday of bluebells in a wood. This is the very first crochet basket that I made working together with two threads a variegated blue size 50 and plain green size 30. I have put a few bluebells inside, well not really bluebells - I copied one of Gina's ideas as I wanted to fill the basket with flowers, still making them in different colours. 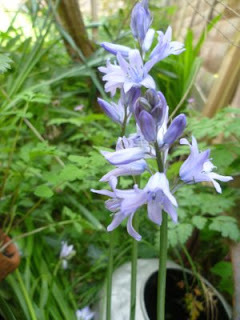 Not every bluebell though is native to England this one is a Spanish bluebell and is usually found in gardens. All the flowers on a Spanish Bluebell are on the same side of the stalk and the stalk is thicker than the English Bluebell. Therefore, the effect of gravity does not operate in the same way on the Spanish Bluebell so that it keeps its characteristic straight stalk. When I was young everyone picked wildflowers and I can remember taking basket fulls back home, especially in the Spring, primroses, bluebells and cowslips. However, with so many species dying out this practice is discouraged and they are protected as much as possible. These two snowflakes are from the book Tatted Snowflakes by Vida Sunderman, the patterns are easy to follow, unusual and fun to make, if you don't mind tying in ends! This book together with Tatting by Rhoda L. Auld I managed to win on e.bay, at different times and strangely enough was the only person to bid on them. Rhoda's book is full of tatting techniques and is very interesting with some great designs and pictures, it is worth looking out for. The top snowflake is called Minaret. The bottom one Ruffle-edged Snowflake, but unfortunately it did not lie very well even when pressed. The question that I have been meaning to ask for months now is this. I have some white Coats thread that has gone yellow, obviously with age and it was probably not stored that well. I have tried, after making something with it, washing the article but cannot get it white, any suggestions? Really need to wash the balls by winding the cotton off them, but how do I do that and is it possible to restore them to pristine white? 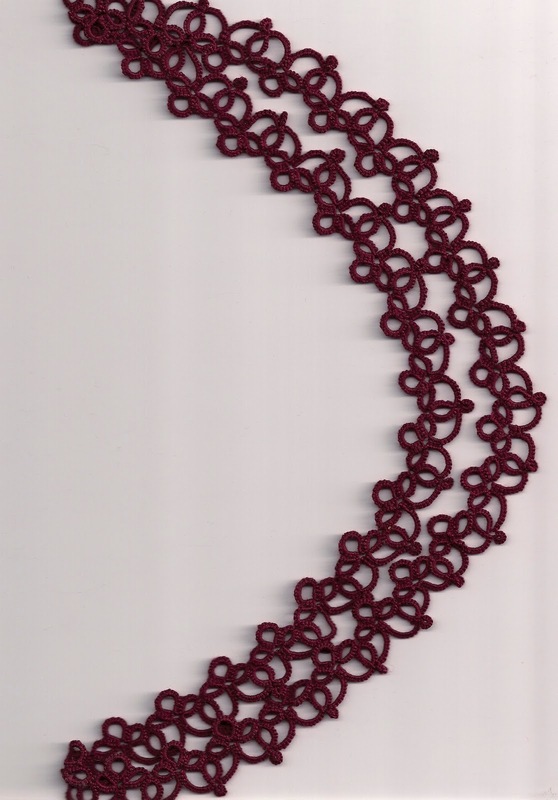 I bought a book called Romantic Crochet by Rhoda Robertson well over ten years ago and nearly gave it away as it was taking up room on my bookshelf, where tatting books were gradually taking over. However, quite out of the blue I decided that I would make something out of it. This basket caught my eye, it was so quick and easy to make and I had some thick crochet cotton lying about in another part of the house. Inside are some entwined tatted hearts which are for a wedding. The instructions require putting the finished piece over a bowl to mould it into shape using sugared water, but I used pva glue to stiffen the basket. I also wove some pink ribbon through it, not shown on the original pattern. This was not the very first one that I made, the other one I will show you later, just need to tat some other items to put inside. It is also not crocheted in white cotton or the same thickness so looks quite different. "We have a choice every day - to act on yesterday's good intentions or get an early start on tomorrow's regrets"
So bearing that in mind I will start the day off with showing you weeks of good intentions, tomorrow's regrets are sure to follow! 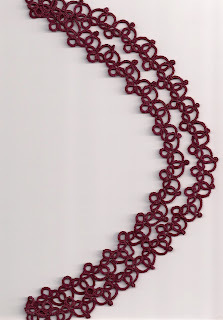 The first is this edging designed by Orsi and called Nelson and it can be found on her pattern page. I really enjoyed working this pattern, thank you Orsi. It is to be sewn on something that will be in my next giveaway, but not for a month or so as I am still working on getting the item ready. With the wonderful discovery of these ezbobs, no longer should there be a tangled threads. I know my sister Jane keeps mentioning them as being terrific but I can see why. This is the latest packet that I purchased from a supplier in England, a rare find, together with how I used to store threads when I needed to travel with them. So my intention is to tidy up the mess that I have got myself into over the years. The last intention, which I am prepared to mention as regretfully there are many others, is piece of tatting. I made it over a year ago and was going to build it up the patchwork, but never got around to it. The pattern is Janes. She is at the moment making a beautiful version and has just posted it this morning. I think the pattern is really clever especially the false picots but looking at my first attempt may be I need a pit of practice first. Pleased to say that my next post will be about items that I have actually completed.